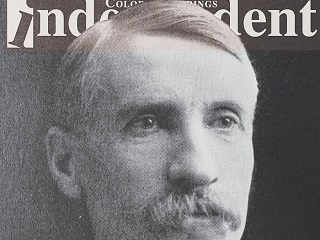 A cover story bookended by a letter from 1901 and a slide show from 2015. There are a number of unusual details in the bio of Colorado Springs Independent columnist John Hazlehurst: he sailed around the world for six years; he worked as an investment banker in New York in the 1980s; and he served for six years on the Colorado Springs City Council in the 1990s. 1. Who are these guys? A ’60s rock group dressed up for Halloween and sprawled languidly on the front porch of an old frame house? They might have been called Doctor John & The Aldermen. That’s Mayor John Robinson (front row, second from right) and the Colorado Springs City Council (then called aldermen) in 1901. Average age: about 37. The average age now is closer to 60. In his hopeful essay about the City Council starting to lean younger, Hazlehurst also includes an amazing time-capsule letter written by Robinson in 1901 and sealed until 2001. Read it here. A couple of other elements lending heft to Hazlehurst’s take, headlined in honor of the Coen brothers 2007 film No Country for Old Men: He’s a Colorado Springs native and his great-grandfather came to the state in 1859.